EasyEDA Editor has a clearly and friendly user interface. You can use its every function very easily when you become familiar with EasyEDA. 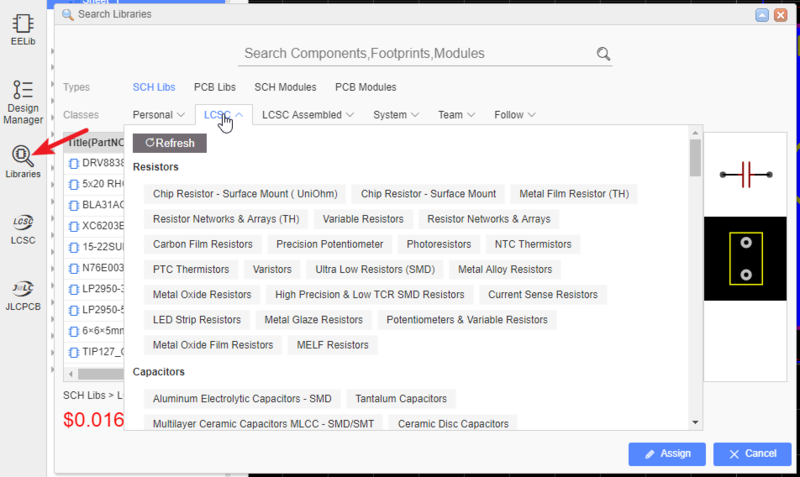 Before using the Filter, you need to select what module you need in the left navigation panel, and then you can quickly and easily find projects, files, parts and footprints, just by typing a few letters of the title. For example, if you want to find all files containing “NE555” in the title, just type “555”, it is non-case-sensitive. 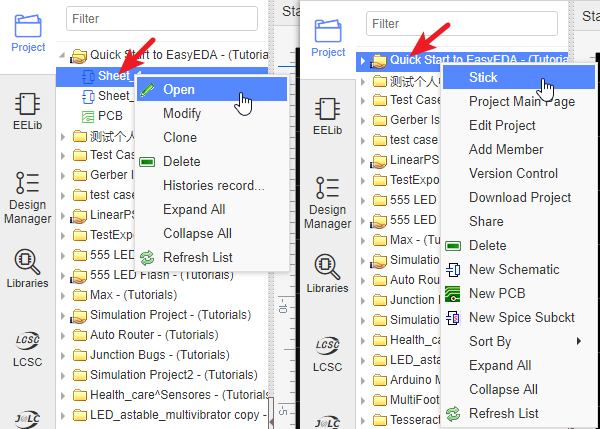 The Filter only searches project, file and part titles and names. It does not search the Description and Content fields. Click the X to clear the filter. 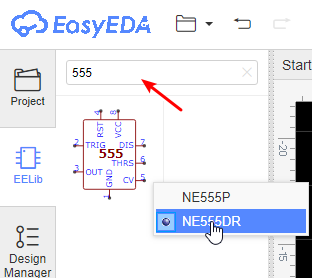 The Navigation panel is very important for EasyEDA: it is from here that you can find all your projects, files, parts and footprints. Here, You can find all of your projects that are private or shared with the public, or fork from someone else’s. EElib means EasyEDA Libraries, It provides lots of components complete with simulation models, many of which have been developed for EasyEDA to make your simulation experience easier. Design Manager, you can check each component and net easily, and it will provide DRC(Design rule check) to help your design better. Contains schematic symbols and PCB footprints for many readily available components and projects. And your own libs and modules will show up here. 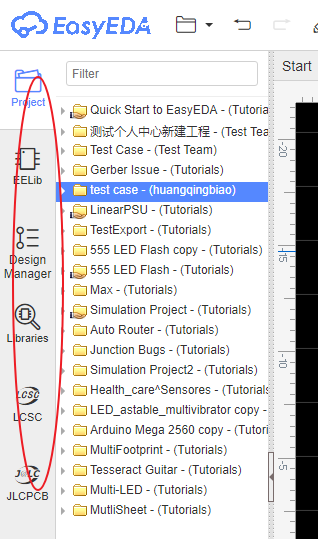 If you want to buy components to finish your PCBA, you should try the LCSC module, LCSC.com and EasyEDA are the same company. EasyEDA partners with China’s largest electronic components online store by customers and ordering quantity launch https://lcsc.com. LCSC means Love Components? Save Cost! We suggest to our users to use LCSC parts to design. Why? Small Quantity & Global Shipping. More Than 25,000 Kinds of Components. It is easy to order co after design. You can save 40% cost at least. You can use our components’ symbols and package directly in EasyEDA editor. More than 200,000 customers worldwide trust JLC, 8000 + online orders per day,JLCPCB (Shenzhen JIALICHUANG Electronic Technology Development Co.,Ltd. ), is the largest PCB prototype enterprise in China and a high-tech manufacturer specializing in quick PCB prototype and small-batch production.Affordable, series quality boards fully manufactured in China. Fully e-tested. Transparent pricing. EasyEDA think that, by using the icon is better than the text menu for the toolbar. Click on a button to select it. Then you can toggle button visibility by clicking on Show/Hide or by clicking on the tick space to the left of the button icon. You can change the button position using Move up and Move Down. Many of the buttons have been assigned hotkeys, so you can use those to replace the button actions. The Preview dialog will help you choose components and packages and can help you to identify schematics and PCB layouts. View > Preview Window . The Preview Dialog has a resizing handle in the bottom right corner. The Preview Dialog can’t be closed but double clicking on the top banner will roll up the panel or you can click the top right corner — . Double clicking top banner again toggles it back to the selected size. Clicking on the little pencil edit tool opens the item in the preview for editing. Clicking on the location place tool in the top right corner of the preview dialog places the item onto the canvas. If you try to place PCB footprint into a schematic it will not provide any action and message. Wiring Tools are document type sensitive: different document types have different tools. To keep EasyEDA’s UI clean and sharp, the Wiring and Drawing tools palettes can be resized horizontally, rolled up or hidden so if you want to focus on drawing, you can roll up or hide the others to make more space and reduce the clutter. You can find the canvas Properties setting by clicking on any of the blank space in the canvas. if you double-click the blank space the attribute dialog will pop up. 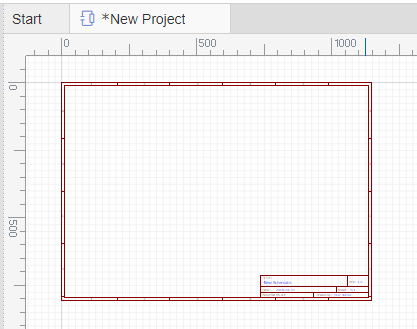 Background and grid colors and the style, size, visibility and snap attributes of the grid can all be configured. The canvas area can be set directly by the Width and Height or from available preset frame sizes. This is where it all happens! This the area where you create and edit your schematics, PCB layouts, symbols, footprints and other drawings, run simulations and display WaveForm traces.